Activision and Blizzard, they're now tight, combining Guitar Hero and Call of Duty's dollars with those World of Warcraft rakes in on a monthly basis. But what's the split between the two? 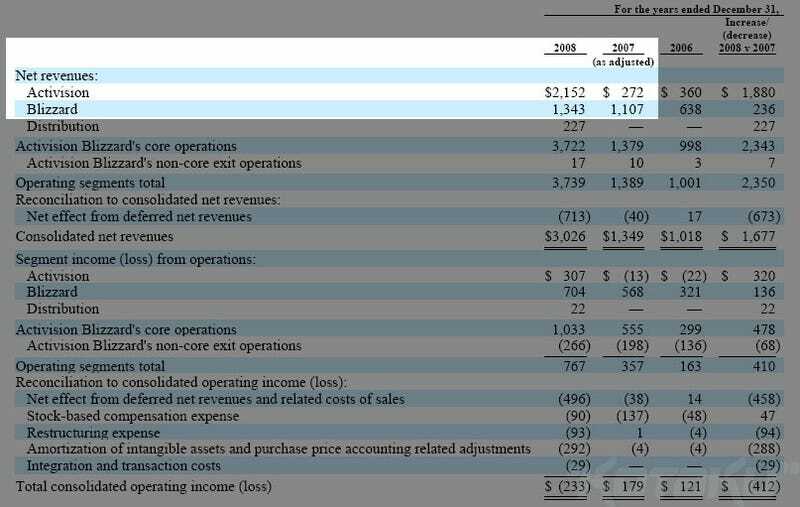 Activision's freshly-released annual report lets us know (using net revenue as a yardstick). And the winner is...Activision, who for 2008 (and we're talking calendar 2008 here) raked in $2.1 billion. Blizzard, meanwhile, could "only" pull in $1.3 billion (with 97% of that income derived from World of Warcraft subscriptions). So it's Activision that are top dogs. But that's coming off a year in which Guitar Hero really exploded into the mainstream, and which saw not only the release of Call of Duty: World at War, but also the majority of Call of Duty 4's sales. The year before that? Blizzard again cracked the billion mark, earning $1.1 billion, while Activision made a net revenue of only $272 million. No wonder Blizzard's books looked so good.